Stinky. Awesome. Scientist. Wow. Fun. Maybe. Smelly. Slimy. Smooth. Weird. Surprising. These are some of the words our fourth graders used to describe their hands-on science lab this week after they dissected sheep brains in the lab with Katie-Rose and Erica. 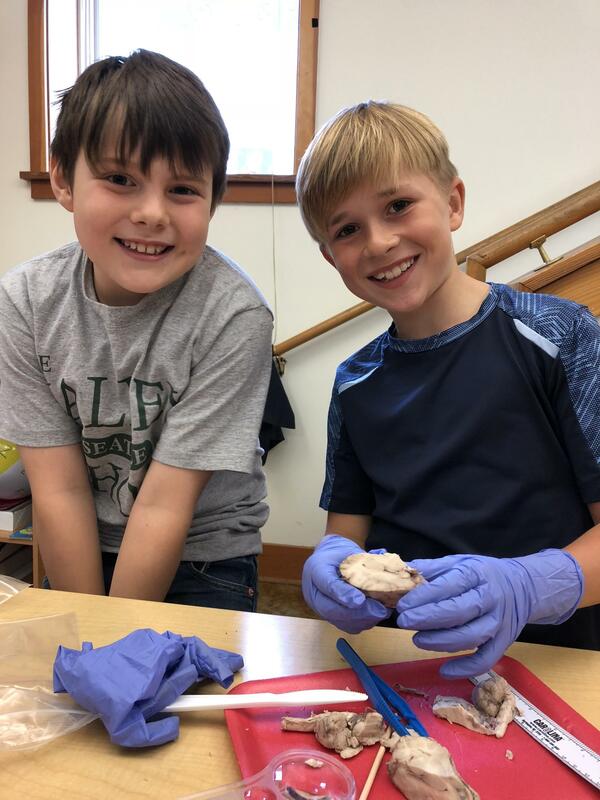 As part of their first science unit, My Brain & Me, these scientists carefully worked with tools to discover and identify many parts of the brain. 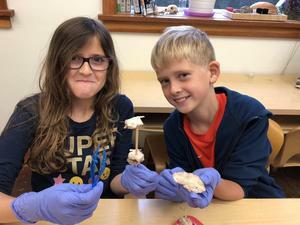 Sheep brains are much smaller than human brains, but have similar features and are a powerful teaching tool to use while learning about the anatomy of the brain. Students identified the external and internal parts of the brain that are also present in human brains including: the cerebrum and the cerebellum, ridges (gyri) and grooves (suici), olfactory bulbs, both hemispheres. 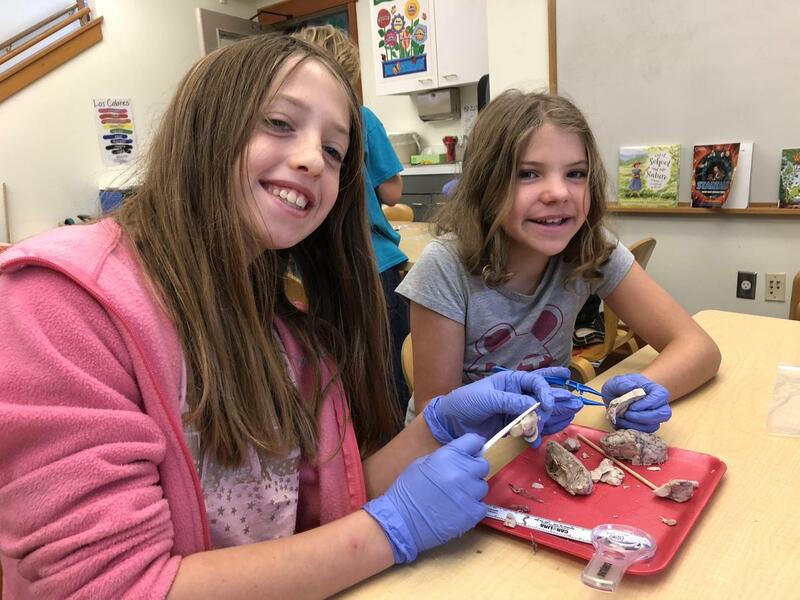 Once cut open, students located the corpus callosum, the medulla, white and gray matter, as well as various lobes and glands and the spinal cord. Students and teachers agreed it was fascinating! After the lab, students shared observations, learnings and surprises with classmates and teachers. One student noted, “I was surprised to see that these brains were all grey and not full of color.” Another shared, “I was surprised how many parts there are in our brains and how small some of them were.” One scientist offered, “I think our sheep wasn’t very smart because our brain didn’t have many ridges and we have learned that this can be a sign of lower intelligence.” Another connected, “I hypothesize that if we cut out certain ridges in the brain, you would lose all kinds of information, or even your memory!” Everyone agreed they thought like scientists: they were careful, curious and respectful of the lab materials and environment. 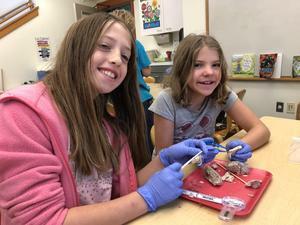 The fourth grade brain unit has become a unit that Valley School students really look forward to. This year, with the addition of Katie-Rose as our lead upper school science teacher, they worked together to plan an especially creative and engaging unit. 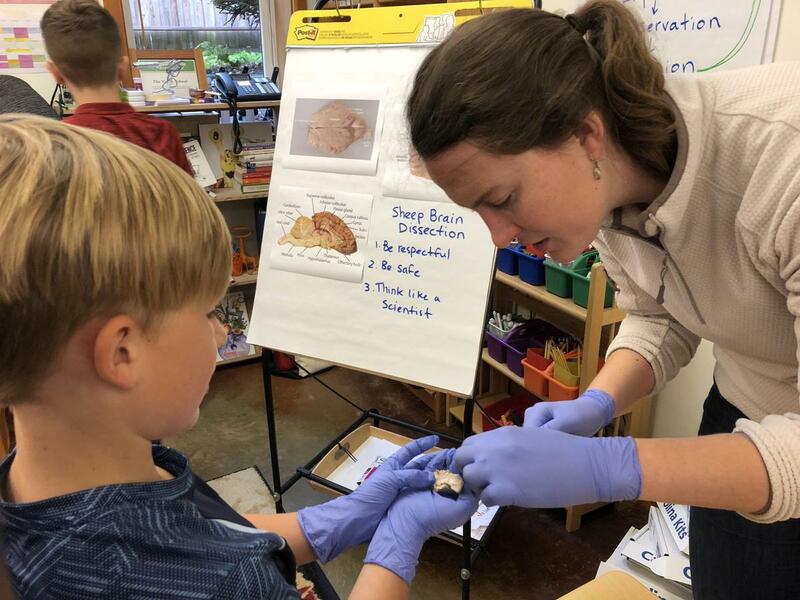 Together they have introduced our fourth graders to the anatomy of the brain, how the human brain works and how we learn, connections between our thoughts, feelings and actions, growth mindset, and hands-on experiments designed to test some ideas about how our brains work. Some of the other science lab activities this fall include: experiments to test our reflexes, experiments that helped us understand the messages that our nerves get from our senses and experiments that helped us slow down our thinking so we can observe our brains’ decision making process. What is a sleeping brain’s favorite musical group (rock band)? REM. What does a brain do when it sees a friend across the street? It gives a brain wave. What do neurons use to talk to each other? A cellular phone. What do you call a skull without 1 billion neurons? A no-brainer. What do you call a group of brains who form a singing group? A glia club.